More and more facilities are moving away from the smoky, misty, hazy shop floors to a cleaner, brighter, fresher air machining area. In doing so, they are searching for not only a unit that is easy to install but REALLY provides fresh, clean air and actually eliminates mist! 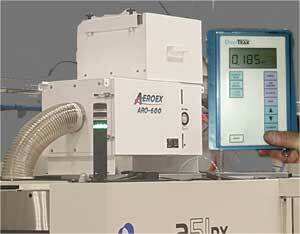 EdjeTech Services represents one the fastest growing mist collection companies in the world – AEROEX! 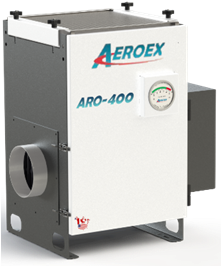 The AEROEX Multi-Stage Mist Collector actually eliminates mist and smoke, and reduces odor. OSHA requires air limits of < 5.0 mg/m³ and NIOSH recommends < 0.4 mg/m³ at a time weighted average over 8 hrs. Furthermore, most companies with H&S and unions are using limits of 0.5 mg/m³, and some are going even lower with a desire to reach 0.3 mg/m³. The AEROEX ARO Mist Collector with HEPA filters clean air can be <0.025 mg/m³, without HEPA filters most eliminators are above 0.5 mg/m³ and don’t remove smoke, steam or bacteria. Fine mist & bacteria is the major cause of health problems. The ARO Mist Collector comes standard with HEPA 95% @ 0.3 µm (coolant & oil) or a HEPA 99.9% @ 0.3µm (oil, smoke, wash water/steam) as an option. The ARO Coolant Mist Collector filters the mist from the CNC machine cabinet through four (4) stages. The primary filter pack has stage 1, 2 and 3. First is the Mechanical Element (ME) which is smooth and drains fluid quickly, Second is the Agglomerator Filter (AF) which is a cleanable eight-layer stainless steel wire mesh weaved with fibers for cross flow depth filtration. It is a excellent at draining, difficult to blind, durable with an average 10-15 year life. No mist collection manufacturer comes close to the service life of this filter. Third is the Coolant Mist (CM) Fiber Bed Filter that further filters the air removing smaller contaminants. The fourth and final stage of air filtration is the HEPA Filter (HF) which is 95% efficient @ 0.3µm and is the standard filter for the ARO Mist Collector, an option is an HF that is 99.9% efficient @ 0.3µm. The ARO Coolant Mist Collector also has an On-Line Cleaning System that flushes stages 1 and 2 with coolant at 25to 80 psi. This greatly reduces any manual cleaning and increases filter life. In fact, units have gone up to 4 years without replacement. 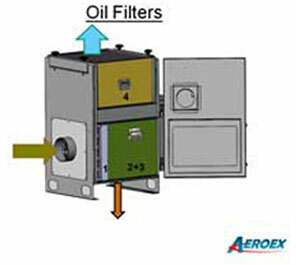 The ARO Oil Mist Collector filters the mist from the CNC machine cabinet through four (4) stages also. The primary filter pack has stage 1, 2 and 3. First is the Mechanical Element (ME) which is smooth and drains fluid quickly, Second and Third stages are combined and is the Oil Mist (OM) Fiber Bed Filter which is two filters in one. The fourth and final stage of air filtration is the HEPA Filter (HF) which is 95% efficient @ 0.3µm and is the standard filter for the ARO Mist Collector, an option is an HF that is 99.9% efficient @ 0.3µm.